Then what am wasting your time for, you are wondering, yes? Well, it's true that I don't have a recipe, but what I have, and will share with you here, is way better than a recipe. It's in fact a fool-proof way to make Pad Thai -Pad Thai for just about anyone from beginners to experts. I must warn you that I will a bit wordy. I could easily write a very short description and make everything looks and sounds easy -but that means I'd be leaving you to figure out the details on your own. Or I could explain every step of the way so that you understand what goes into a Pad Thai and what distinguishes a great one from the usual blah. The piece might look a little intimidating, but I think it will in fact be easier than any easy-looking recipe. And, I promise you, if you read through the entire thing, you'll never have to look at another Pad Thai recipe. You'll be set. Really you will. Another common mistake in a Pad Thai recipe is to season while cooking in the wok, which once again get in the way of that super-heated wok-quickstep I mentioned before. If you follow those recipes that have you measure a tablespoon of fish sauce and one of tamarind and yet another of palm sugar into the hot wok during the cooking, you are –it pains me to say- doomed to failure. By the time you're done adding all the whatnots, your noodle turns gooey, your protein done to the texture of a rubber eraser, and your perfectly innocent Pad Thai becomes what I call a sorry excuse of the dish. Bad all around. Once again a little street sense can help a whole lot. Pad Thai vendors in Thailand don't season their Pad Thai one portion at a time. They usually have a giant vat of sauce pre-made waiting patiently by the wok station. As they cook a portion they add the sauce -no guess work, no fumbling with this bottle and that, a ladle full of the pre-seasoned sauce and that's it. Easy enough, yes? That's how I do it. I make my sauce beforehand. I don't even care if I make too much sauce, since it keeps quite well in the fridge for a long time –comes very handy for a quickie Pad Thai fix later. I also prepare all the other ingredients and have them ready. (You can be fancy and call it mise en place like the French do, or just a simple meez like all the American cooks I know.) When my guests arrive I get the wok smoking hot and make one or two portions at a time until everyone has their fill of the noodle-y goodness. They can even take the wok on a spin and make one on their own. My friends get a kick out of that, yours might too. So you begin by preparing the sauce. There are four ingredients in the Pad Thai sauce, Tamarind pulp (for the sour flavor), Fish Sauce (for the salty part), Palm Sugar (for a slight sweetness), and Paprika or Thai chilli powder (for the spice). Two cups of sauce will make about 6-8 portions of Pad Thai. You can make your Pad Thai sauce vegetarian by using this sauce instead of fish sauce. To make about two cups of sauce, you should begin with about ½ cup each of Tamarind (*see the note below for how to prepare tamarind pulp), Fish Sauce, and Palm Sugar. If you substitute white and/or brown sugar for the Palm Sugar, you should use only about 1/3 cup. Melt all these together in a small pot over a low flame. Taste and adjust the flavor balance until it suits you. Then add the chilli powder, begin with a teaspoon or two, depending on your taste, and keep adding until it tastes the way you like it. By the time you're done flavoring the pot should be simmering happily. Turn off the heat and let the sauce rest while you get to the other ingredients. At this point in the game I like my sauce to lead with a salty flavor, follow by a mild sourness, then just a gentle sweetness and a soft caress from the chili at the back of my throat at the very end. A finished plate of Pad Thai will be served with a sliver of lime and extra chilli powder to be mixed in at the table, so you could keep these two flavors in the sauce mild for now. I don't know about you but there is nothing I hate more than a cloying sweet Pad Thai. If your sauce starts out super sweet now it will be very tough to correct later. Those of you with a scientific mind might want more precise measurements or proportion or whatnot. I'd do it if I could, but the problem is most Thai ingredients are not standardized in the way that a Western ingredient, say, white granulated sugar, is. A cup of granulated sugar is always the same, but a cup of your Palm Sugar or Fish Sauce might not have the same intensity as mine. So the easiest thing to do is just to taste. And herein lies another beauty of preparing the sauce ahead of time. You can take your time to taste and adjust the sauce precisely to your liking, which would be hard to do à la minute in the wok. Now that you have your sauce ready and waiting, you can prep the other ingredients. Here's a list of what you need, and the quantity to use per portion. Thin rice noodle, also called Rice Sticks. Get them fresh if you can find them at your nearby Asian markets. If not, buy dried noodle and soak in warm water until soften. Don't soak until the noodle is soft enough to eat, or it will turn into mush in the wok. Just do it until it's pliable, then drain well. You will need about 1-2 loosely packed cups per portion, depending on how carb-happy you are. You can use more or less, entirely up to you and your friends. A 500g (or about 16oz) bag of dried noodles should be enough for 6-8 portions. Buy a little extra just to be sure. It's cheap and, if left unsoaked, will last just about forever. Depending on the freshness of your 'fresh' rice noodle, you might want to soak it anyway just to soften it a bit more. Follow the same step as the dried noodle but do not soak for as long. One normal bag of fresh noodle, usually around 500g, will be enough for 3-4 portions. The more traditional version of Pad Thai uses shrimps. I use about 7 pieces of medium size shrimps per portion, peeled of course. You can be as generous as you want. You can also easily substitute chicken, about 2oz of chicken meat (cut into bite-size pieces) per portion will be plenty. I usually crack one small egg into the wok while cooking each serving. If you dinner guests like less egg you can make two servings at a time and only crack one egg into the wok while cooking, essentially cutting the egg quantity in half in each portion. I use roasted and unsalted peanuts (sometimes I roast my own) for this. Ground the peanuts roughly, beware not to overdo it as you will end up with peanut butter and not ground peanuts. You will need 1-2 tablespoons per portion, depending on how much your friends like peanuts. Bai Gui-chai as they are called in Thai. Although most restaurants use the green part of green onions or spring onions, Garlic Chive is the more traditional herb for Pad Thai. Wash and dry the chives carefully, then cut into 2 inches pieces. I use a handful of them per portion. I love a lot of beansprouts in my Pad Thai, so I use almost a full cup per portion. You can use as much or little as you like. You can even skip them entirely. You can buy pickled turnips pre-chopped in a plastic bag, but I think the whole ones are fresher. I chopped whole turnips into small bits, and use about 1 tablespoon per portion. The cheaper versions of Pad Thai on the streets of Bangkok are made with only tiny dried shrimps and no fresh ones at all. I don't want to go that far, but I still like to add a bit of these salty dried shrimps for extra flavor -you can easily skip it altogether. I take a bit of dried shrimp and pound in a stone mortar and pestle until fluffy. It's important to use the mortar here and not your cuisinart, which will turn to dried shrimp into a hard, dried chunks (entirely capable of cracking a tooth) instead of fluffy bits of salty shrimp. I use about 1-2 tablespoon per portion. I like to use a little bit of garlic in each portion, give it an extra kick. You don't have to. Slivers of lime, extra ground peanuts, extra chilli powder, fish sauce, and even a bit of white sugar. Just like other street food in Thailand, everyone can tailor the final dish to their own taste. I suggest a squeeze of lime for sure, and anything else that pleases you. Toast yourself with a glass of champagne now that the prep is done before your dinner guests arrive. A nice off-dry and not oaky champagne will go well with the Pad Thai later too. Lovely Rieslings will do fine as well. While you're savoring your champagne, let me tell you a bit about that temperamental beast that's your well-seasoned wok (**see note below). The success of your Pad Thai depends on it. A wok is not built for heat retention or long and even cooking, unlike a Western style pots and pans. A Le Creuset pot, for example, is built like a marathon runner, slow to warm up but has a long staying power. A wok, on the other hand, is more like a sprinter. It heats up really fast, and loses it just as quickly. The thin iron steel material in a good wok transfers more or less all the heat from the flame directly to the content inside. This is great for the ability to control heat, you can turn the fire up and down and the heat in the pan will rise and fall just as quickly. This also means that a wok can sear and cook a small amount of food lightening fast. Adding too much all at once and letting the heat escape would turn a wok into a useless piece of tin in a blink of an eye. And since the caramelization and charring from a hot wok is where the wok-flavor, or wok-breath as some call it, comes from, your utmost goal in wok-cooking is to start out hot and keep it hot! Make sure that all your ingredients are at room temperature, and that you add them in sequence and let the wok reheat back up before each addition. At no time should you add a huge amount of ingredients all at once, unless you want a Pad Thai stew. Now you are ready to make a Pad Thai. Follow these steps carefully and the best Pad Thai you've ever had will be the one you've just made! Keep the sauce pot warm on another burner next to your wok. Keep a bowl of water handy too, if things get to hot in the wok you can sprinkle the water on it to slow it down. Heat a large wok over high heat until very hot, to the point of smoky. Add a splash of oil, about 3-4 tablespoons. Don't be shy, this ain't no diet food. If you are making chicken Pad Thai, add the chicken first, cook, stirring vigorously, until it's half way done, about 1-2 minutes, then add the tofu, a tablespoon or two of the sauce to flavor the chicken, and a pinch of garlic if you're using it. If you are making tofu or shrimp and tofu Pad Thai, then only add the tofu (and garlic) for now. Cook for another minute until the tofu is crisp and slightly brown at the edges. Add the noodle, about 2 loosely packed cups for one portion is my standard, and then a ladle (about ¼ cup) of warm sauce. Stir rigorously, keep everything moving in the wok, and cook the noodle until soft. Remember to break up the noodle and don't let it lump together. If the sauce evaporates too quickly and your noodle isn't quite ready, sprinkle a bit of water and keep stirring. Add a bit of oil if the noodle still stubbornly sticks together. As I said, this ain't no diet food. When the noodle is ready (taste it to be sure), push it up to one side of the wok and crack an egg into the middle. Let it set for 10-15 seconds and toss everything all together. Add the shrimp meat, pickled turnips, ground peanuts, ground dried shrimp, beansprouts. Keep things moving. Add more sauce if it looks a little pale. When the shrimps are done, shouldn't take more than a minute, add a handful of Garlic Chives. Turn the heat off, and quickly give the wok a good stirring to mix everything together. Add the finished Pad Thai to a plate and serve to your first lucky dinner guest. Give the used wok a quick rinse with warm water, wipe off any excess bits of food with a warm towel, then put the wok back on to the fire. As soon as it heats back up to a smoking point, you're ready to do another portion. Repeat this process until all your dinner guests are fed. Keep them lubricated and happy with ample supply of Riesling, Champagne, and/or beer while they wait. That's how I do it! That's it friends, your lesson in Pad Thai. It's a bit long, like I said, but this will be the last thing you'll ever need to read about Pad Thai. You might never go out for Pad Thai again, even! You can buy tamarind in blocks or readymade pulp that comes in plastic or glass containers (see the photo above). If you buy readymade pulp, check to make sure that the ingredients only contain tamarind and water, no sugar or anything else. If you buy block tamarind, soak the block in 4 cups of hot water in a large bowl. Mesh the tamarind and water together and let sit until the water cool down enough not to burn your hands. Stick your hands -your impeccably clean hands as Julia Child would say- into the bowl and work the tamarind and water together until the consistency is a bit looser than room-temperature ketchup. Add more warm water if needed. 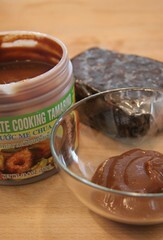 Then, strain the mixture to remove the pits and tough membranes from the tamarind pulp. The consistency will be thick enough that you'd need to press it through the strainer. Use as much as you need for the Pad Thai sauce and keep the rest in a glass jar in your fridge. You'll have tamarind pulp handy for a long time. This recipe is highly adaptable. Some people don't like the intensity of tamarind. Fine, just use less tamarind and add simple white vinegar til your desired sourness (pun intended). You won't be able to get rid of tamarind all together. Without it your Pad Thai won't be much of a dish, but you can use about half the tamarind I use and supplement the rest with vinegar. First of all, you'll need an iron steel wok -the cheapest kind made of a thin layer of iron steel that's sold in practically any Chinese market. There's no need to buy anything fancy, mine was less than $15 and it's working out great. You just have to keep it well-seasoned and it will last practically forever. At any point in the making of this superb Pad Thai, if anything sticks to the pan and won't come out easily with a gentle push of a metal spatula, your wok isn't well-seasoned. No, no, you don't have to rush out to buy a replacement. You just have to season it again. There are plenty of ways to season a pan, here's how I do it. First, add to your wok one cup of oil –make sure you brush the oil over all the inside surface of the wok- and heat the wok until it is smoking. Tilt the pan around to keep lubricating the surface with oil and let it continues to smoke for a few minutes –make sure your smoke vent is running and all the windows are open, by the way. Then, take the pan off the heat and dispose of the oil. Pour half a cup of kosher salt into the wok and, with a kitchen rag, rub the salt all over the inside surface of the wok. Throw out the salt, wipe the wok clean with a damp towel. Pour a small amount of oil into a paper towel and wipe the oil all over the inside surface again. Your wok is now seasoned and ready. I'll be sitting here, waiting! I can't wait!!! I just adore Pad Thai! Look forward to it! This one will go in the del.icio.us cookbook for sure. This is a like waiting for a pot to boil... The picture looks great. That looks amazing and sounds delicious. I am looking forward to trying it! Pim, I've saved it already. I would have never guessed there was tamarind in Pad Thai; never quite could identify what that slightly sour taste was before this! Thanks. Oh- Kalyn, get ready to add tamarind to everything (curries too). Sounds good Pim- you hit my favorite flavor itches. I also like to dress mine with a splash of lemon or lime, crispy fried shallots, cilantro and that sweet chili garlic vinegar sauce. I've never been much of a fan of adding peanut sauce as is so popular around here. Thanks for the lengthy description of the method, I now have a better understanding of the dish and learned a few new tricks. Hello! I love your site, though the new format is taking some getting used to...I am looking for how to access the archives, can you direct me? And thank you for such a wonderful, generous sharing of your talent and good fortune! Excellent work. I recently made Pad Thai, with results I was not totally satisfied with. You inspired me with some fresh ideas. Thanks! Never thought to see tamarind in pad thai. I am bookmarking this. Will definitely make it soon. Hubby is a fan of pad thai! I love the prepared tamarind paste/sauce in the jar. So convenient and so many uses too (tom yum, canh chua). I must admit, in my early versions I succumbed to ketchup - it added sweetness and more importantly "redness". However, since I've discovered tamarind paste and like you suggest add paprika, those days are long gone. Add fresh noodles cannot be beat in terms of consistency and stir fry convenience. Thx for the wonderful primer. Thanks for this pad thai technique. I think most stir-fried Asian foods can be made using one root technique. The real key is understanding the way your ingredients cook in the wok, and hence the order you should use when adding them to the wok. Proper wok cooking is all about heat control. This excellent post has just taken me one step closer to fried noodle mastery. I found the section on frying rice noodles, which behave differently compared to wheat noodles, particularly useful. I love pad thai so thanks for the recipe as, yes, all the others I have seen do involve ketchup! In civilised society we do not leave curt, nitpicking comments (in English or any other language) on someone else's blog without even thanking them for the recipe they have just shared in generous detail. I'm sure your Thai grammar is absolutely perfect, but that is still no reason to be so persnickety about Pim's English grammar. Pim, this is an exceptional post. I've been struggling with pad thai for years. I love the detailed description of cooking, links to ingredients, and the photo stream right on the post. Wow! I'm a bit curious about paprika. Do you use it instead of chili powder to keep the spiciness down? I assume it's not traditional. And, what kind of chili powder do you use? (Type, brand, etc.) Finally, a wok question: do you always use a metal spatula? Or do you ever use wok chopsticks? Whenever I use a metal spatula on my carbon steel wok I seem to gouge through the seasoning layer. Is my wok just too new? (I thought I seasoned it pretty well--I can cook an egg in it without problem.) In any event, thanks for a wonderful post. From the Oxford Dictionary. Oxford...that's in England, I believe, where they speak English, presumably. Please remember this. I make pad thai about three times a week--it's my favourite fast food! But I wasn't adding the sauce until after the egg. And things get a bit sticky. A ha. Now I know. Pim this is the best ever. I can't wait to make this at home a in the past my noodles have always stuck (and sucked). I must say that I much prefer those dried prawns to fresh, so much so that I snack on them instead of Pringles. Who the hell are these people who want to put ketchup in this dish??? Pim, I am so excited about this. What an act of generosity. Many Thai restaurants in the US use bottled fish sauce or oyster sauce, most of which have gluten. So I'm doubly glad to see this primer on how to make it at home. What's up with folks defending bad language use? Who said I can speak Thai? Maybe I can, maybe I can't. The website it is English. It is for the author's benefit that I told her in English the correct plural form is "shrimp". And it is. The same goes for "fruit". Of course there is a special use for "fruits" but not in the sense of "five apples and three pears". Rather, as in "fruits of your labour", so it is idiomatic. The recipe is nice but could be improved with better grammar. Cheers. Thank you, thank you so very much! For years I have been struggling to, at the very least, be able to make a decent Pad Thai. Unfortunately without any success, mostly due to the famous ketchup ingredient those recipes were calling for. Well last night, you inspired me. I followed your directions, for the yummy noodles and am very happy to say that it was a big hit! Ketchup Americanizes Pad Thai. Tamarind brings the authenticity of what a Pad Thai should be. Once again, thank you Pim, for your generosity in sharing your Pad Thai with us, and so well detailed. By the way, "shrimps", is just fine. Oh my Pim, this is the definitive piece on Pad Thai! Thank you so much for taking the time to post. Regarding shrimp versus shrimps, I have never heard the word "shrimps" used in common speech where I live. That said, I looked it up in Google and clicked on their dictionary link and lo and behold the dictionary, which is The American Heritage Dictionary, concurs with the Oxford English dictionary which states that the plural is indeed, shrimp OR shrimps. So a lesson for us all, just because the use of a word is unfamiliar, doesn't mean that it is incorrect. Thanks again Pim for a great post. I found your blog through Food Blogga and you've hooked me. I hear about how fabulous Thai cuisine is and have never seen recipes that looked good--I'm printing this one off and will drag out the wok. Ahem, Pim, sorry to bother you with this, but could you get to the bottom of why "Joanna" is now posting under my name? I know you approve these comments before they are posted, so you might want to figure out if Joanna is a troll (not the Scandinavian kind, no, but the blog-haunting kind, if you know what I mean). If you have the time, that is. On the other hand, you clearly have many better things to do, like making this pad thai for your very lucky friends :-) . Joanna, no, "fruits of your labour" is not, in fact, the only case in which "fruits" is acceptable. Also, please see the numerous messages posted above on this contentious topic: "shrimps" is CORRECT in both American and British English. So no one is defending "bad language use" -- to do that, we would have to try to argue that (for example) "The website it is English" (to quote your own comment) is an acceptable construction. Folks, what's so great about this recipe is that it can be used as a primer not just for pad thai but for almost any noodle-cooking in a wok. The same principles apply: don't crowd your wok, have your sauce ready so there are no unwanted delays, put in "wet" ingredients at the end (I sometimes even add them in after removing the dish from the heat, depending on what's in the sauce). Kudos to you, Pim, for laying it all out so clearly. Thanks aplenty. I am really excited to try this! It seems that restaurant versions of pad thai are really hit or miss for me. Some versions (at what were probably more authentic places) I absolutely loved, while others served horrible sticky, peanutty, sugary globs I just can't do. It seems that this approach might just be what I'm looking for! Easy question: I know that it's hard to give measurements in this case, but is there a general starting ratio of the four sauce ingredients? I'm all about the tinkering and adjustments, but I'd love to have a basic starting suggestion, like "3 parts tamarind, 1 part fish sauce, 2 parts sugar, 1 part paprika" or something. Any thoughts or recommendations? Thank you for this lovely recipe, Pim! I found your website through Slashfood, and I'm very grateful to learn a "foolproof" method of making this favorite dish. An excellent site you have put together! Thank you for the recipe and all the notes to make it a success and not a failure. My husband loves asian noodle dishes and so far every dish I've tried I've destroyed over the last several years. He recently turned me on to reading food blogs and this is the first I've read that shows me where I've gone wrong before. Also thank you to Nell for your comment with the short version of basic principles to cooking asian food. All errors I'm guilty of. Thanks for the great post! Your recipe is so detail that it beats any of those southeast asian food cookbooks out there! Thanks so much for the recipe! Unfortunately, my first experience with Thai Food was Pad Thai and I think they followed your "do not do" section because my shrimp and chicken were overcooked and the noodles were all gummy and they stuck together. I think I'll try to make your and see what happens. Peyron on Nahm in London, such a waste of 100 quid!! Christina on What is this? frank fernandis on WBW13: pink chocolate? Riveting stories about WWII from the point of view of wine. I couldn't put it down. This is quite possibly the most used cookbook in my entire collection. If you can judge a book by the wine stains left in it. This is a great one. It seems every self-respected cook has a Julia Child favorite. This one is mine. My go-to reference for all things wine. It's a tome, yes, but one that doesn't sit collecting dust on my shelf. The book is thick and the prose at times thicker, but this is the most comprehensive collection of authentic Thai recipes I have ever seen in English or Thai. The indubitable reference for French gastronomy. Vietnamese food is at once familiar and foreign to me. This fantastic book is helping me change the latter. The book for Burgundy lovers. It's a bit dated, but still the most comprehensive.